Like many people, I often think of what I would do or ask if I was in the presence of a great historic person. I remember when I had the privilege of spending time with the late Lakota Elder and Medicine man, Grandpa Wallace Black Elk. I asked him to tell me one thing I could do to help the next generation. He looked at me with his ancient face and said, "We need more interpreters and translators. We need people like you to take the ancient stories and tell them in a way so that the next generation understands them. That is the challenge." Those simple but powerful words never left my thoughts. Recently I had the pleasure of working with Cochiti Pueblo Native Virgil Ortiz. Virgil is a groundbreaking artist and fashion designer. His clay works are displayed worldwide in prestigious venues, including the Smithsonian National Museum of the American Indian in New York City, the Stedelijk Museum's-Hertogenbosch in The Netherlands, and his current exhibit at Fondation Cartier's Paris, France show Histories de Voir -- Show and Tell, featuring "Vertigo," a 21-piece clay series on display through Oct. 21, 2012. When he invited me to be a part of his most recent photographic and design project, "Venutian Soldiers," it didn't take long for me to realize that Virgil is one of the ancient interpreters Grandpa Black Elk was speaking about. 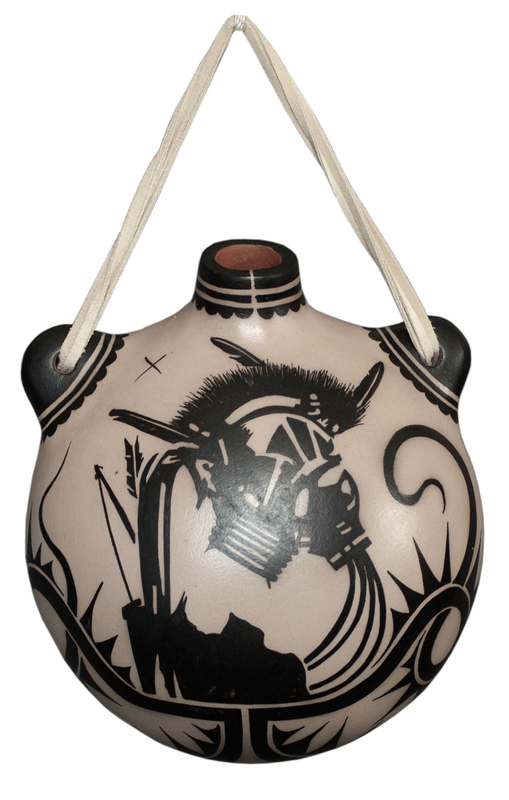 He comes from a long line of famous Cochiti Pueblo artists and as he says, art is in his blood. 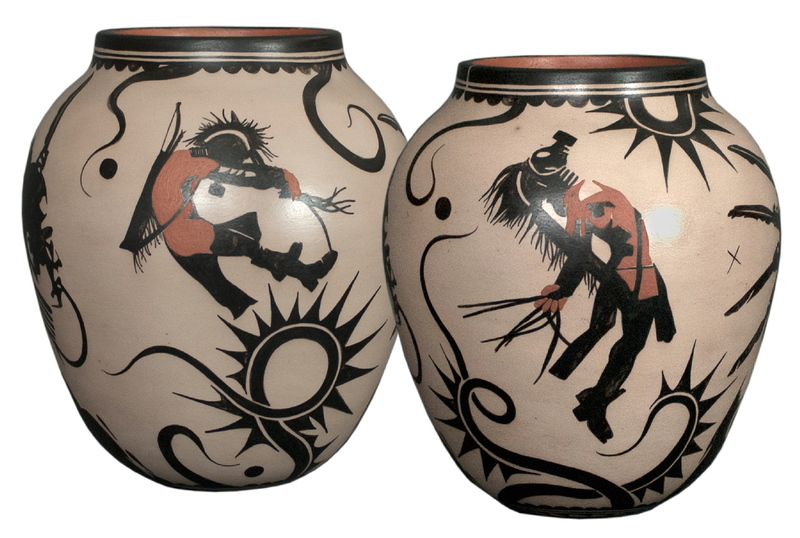 His mother's (Seferina Ortiz) family is known for their iconic "storyteller" pottery work. His father is a well-known drum maker. But Virgil is something else. He has learned how to express himself in a multi-dimensional way. Besides his work with clay and photography, his eye-catching designs are featured on diverse items ranging from exclusive jeans and T-shirts to high-end hotel lobby flooring and draperies. He has collaborated with Donna Karan on one of her most successful lines and has launched his own carpet collection, Indigenous Imprints ®. Virgil met me in Santa Fe, where I recently finished shooting an episode of Longmire (the new hit drama series on A&E). He drove us to his home studio on the Pueblo lands, where he allows his imagination to run free. And let me tell you, Virgil has one hell of an imagination. In about 30 minutes, Virgil gave me a complete makeover, turning me into one of his timeless warriors -- a feat that would normally require several Hollywood professionals, hair, makeup, wardrobe, set design, and props. He truly is a one-man show. As I watched myself morph into an amazingly powerful creature, I understood what Grandpa Black Elk was talking about. Here was a modern day Native storyteller, breathing new life into the ancient stories. Virgil Ortiz is an ancient translator who is catching the eyes and the attention of the world and more importantly, today's Native youth. This is not an easy feat, as I know from all that I have learned on my travels to the Indian reservations. Some elders have asked me how they can motivate the new generation to learn the old sacred ways. They are frustrated by the quantum leap from the old ways to how the Native youth live and communicate today. I tell them that we need a new way to interest the youth, a new take on the traditional teachings. It all starts with getting their attention and Virgil has found a way. His new exhibit, which I am proud to have been part of, is at the Zane Bennett Gallery in Santa Fe beginning August 16. 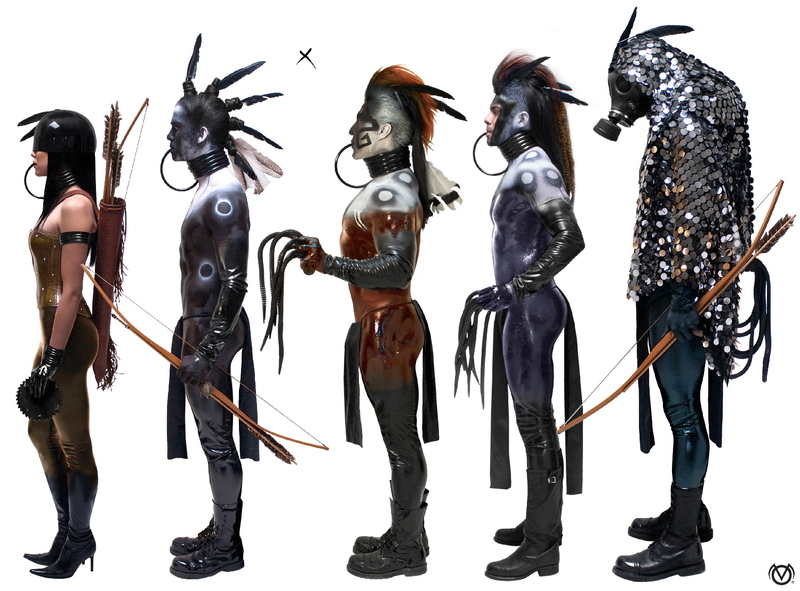 It's a new take on a pivotal event in Pueblo history -- the 1680 Pueblo Revolt -- captured in sculpture and photographs of his Venutian Soldiers. These days, when Native designs and patterns are copied by so many top designers, it's good to have a real Native create and share his own vision. Recently, there has been some controversy over the abuse of certain Navajo designs that were used on underwear without any respect or consideration that the images printed belonged to Native families. These eye-catching patterns are family crests, not just fancy patterns on rugs. 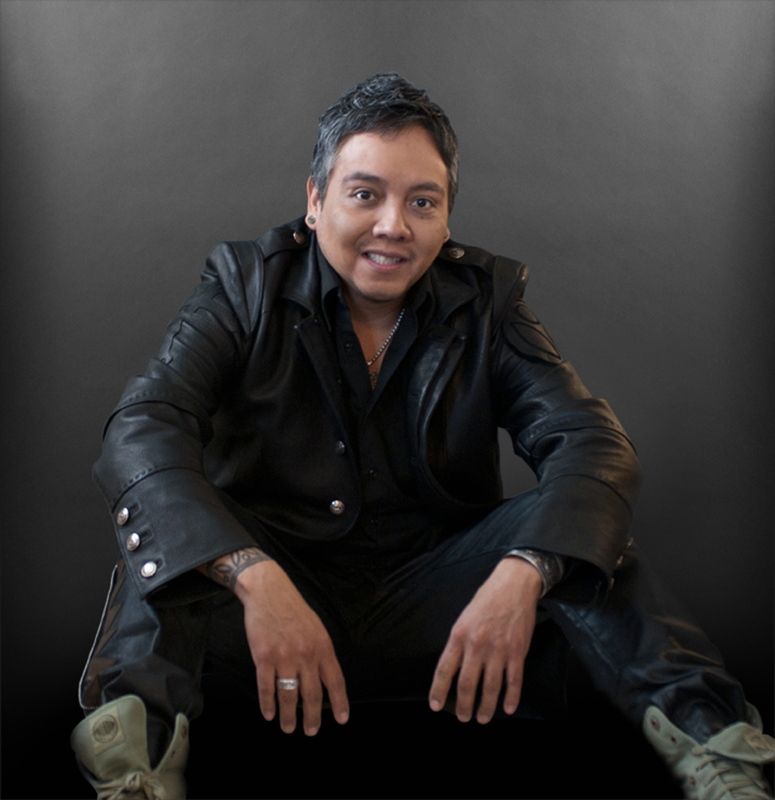 Virgil Ortiz, by contrast, represents his heritage with dignity and style while creating global awareness of his culture and opportunities for his tribal community -- especially the Native youth, which to him are the future. Through his work, he is trusting them with the legacy of his and their ancestors. As Virgil says, "It's important to recognize that Pueblo communities are very much alive and have a level of vitality that speaks to generations of strength, persistence, brilliance, and thriving energy. I have something very important to do before I go. I want to preserve my culture and inspire our youth to accomplish whatever it is they dream to be." 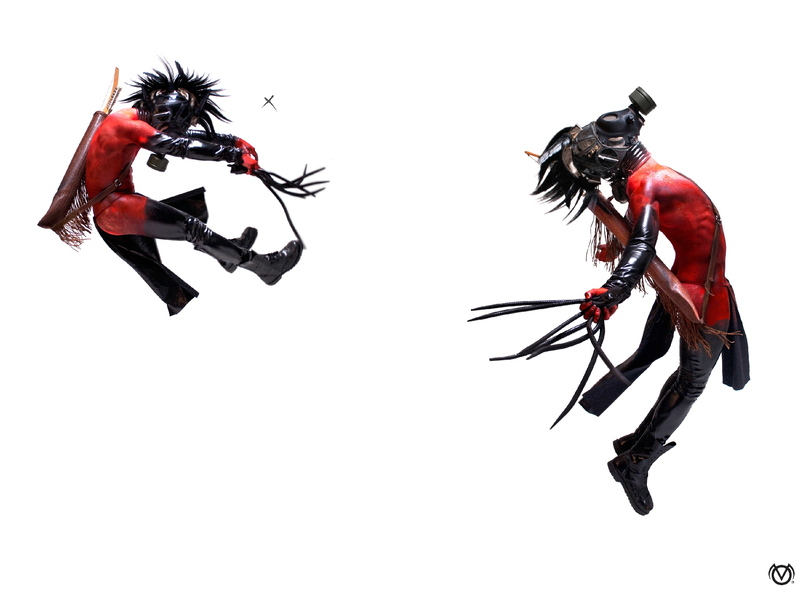 Virgil Ortiz transforming Jay Tavare into "Karshk"
wow that is really neat! AWESOME article. I really like that. It does take different mediums to have children/teens look at their culture. Apparel manufacturer The Gap is currently selling a black t-shirt bearing — with no explanation — the words “MANIFEST DESTINY.” Manifest Destiny is a polite term for the popular 19th-century belief that the United States — a white, European nation — was destined to expand westward across the continent, by any means necessary. In Indian country, the term Manifest Destiny calls to mind the suffering of previous generations of Natives through forced relocation and genocide. More than a few American Indians are puzzled, to say the least, as to why The Gap would choose to sell a Manifest Destiny t-shirt. It is with great sadness that I notify you I will not be shopping at your store until you remove the “Manifest Destiny” t-shirts available at your stores. Manifest Destiny was the catch phrase which led to the genocide of millions of my people, millions of Indigenous people throughout this country. I am also inviting the more than 1700 people on my Facebook page to boycott your stores and inviting them to shop with their conscience. In the past Gap has been known for inclusion, rather than exclusion. I am disappointed to see that your marketing and sales strategies have changed so dramatically. The GAP is selling a black t-shirt that reads “MANIFEST DESTINY”. (this IS NOT the shirt they made, but something i made to show what i see) Manifest Destiny resulted in the mass genocide of Indigenous people, through expansion, occupation and annexation of Indigenous land. I’m pretty pragmatic when it comes to most things. But I think this is a good opportunity educate the folks over at the Gap. I doubt there was malicious intent, in fact, I think it was just ignorance. So I hope they discontinue this shirt, I don’t need the “formal apology”, instead I hope they use their vast marketing presence to help to educate others on the ugly history of how this continent was colonized. See, what they see as a clever little shirt on “how the west was won” or maybe a “YOLO, make your own destiny” type of shirt – Is not what I see. I’m sadden to think about what my ancestors went through because of the “manifest destiny” mindset, and even more sadden to know that the effects of it can still be felt to day. So I make this image, in hopes that the Gap people will look at their shirt in a new light. They won, they can make a shirt. Crass? No, just being a realist. If we had enough power left that the generation of such a garment predicated an issue, there wouldn't be such a shirt. The issue is that most folks that would wear it have no idea what the word means. True. Gap took the shirt off the racks the same day I posted this. I was hoping for more media coverage to at least get some people aware of why this was an issue. Unfortunately most people never found out about the shirt, not to mention its meaning. Gap took the shirt off the racks the same day I posted this. Well, that's a minor victory. The phrase "Manifest Destiny" is most often associated with the territorial expansion of the United States from 1812 to 1860. This era, from the end of the War of 1812 to the beginning of the American Civil War, has been called the "Age of Manifest Destiny". During this time, the United States expanded to the Pacific Ocean—"from sea to shining sea"—largely defining the borders of the contiguous United States as they are today. Manifest Destiny played an important role in the expansion of Texas and American relationship with Mexico. In 1836, the Republic of Texas declared independence from Mexico and, after the Texas Revolution, sought to join the United States as a new state. This was an idealized process of expansion which had been advocated from Jefferson to O'Sullivan: newly democratic and independent states would request entry into the United States, rather than the United States extending its government over people who did not want it. The annexation of Texas was controversial as it would add another slave state to the Union. Presidents Andrew Jackson and Martin Van Buren declined Texas's offer to join the United States in part because the slavery issue threatened to divide the Democratic Party. Before the election of 1844, Whig candidate Henry Clay and the presumed Democratic candidate, former President Van Buren, both declared themselves opposed to the annexation of Texas, each hoping to keep the troublesome topic from becoming a campaign issue. This unexpectedly led to Van Buren being dropped by the Democrats in favor of Polk, who favored annexation. Polk tied the Texas annexation question with the Oregon dispute, thus providing a sort of regional compromise on expansion. (Expansionists in the North were more inclined to promote the occupation of Oregon, while Southern expansionists focused primarily on the annexation of Texas.) Although elected by a very slim margin, Polk proceeded as if his victory had been a mandate for expansion. After the election of Polk, but before he took office, Congress approved the annexation of Texas. Polk moved to occupy a portion of Texas which had declared independence from Mexico in 1836, but was still claimed by Mexico. This paved the way for the outbreak of the Mexican-American War on April 24, 1846. With American successes on the battlefield, by the summer of 1847 there were calls for the annexation of "All Mexico", particularly among Eastern Democrats, who argued that bringing Mexico into the Union was the best way to ensure future peace in the region. This was a controversial proposition for two reasons. First, idealistic advocates of Manifest Destiny like John L. O'Sullivan had always maintained that the laws of the United States should not be imposed on people against their will. The annexation of "All Mexico" would be a violation of this principle. And secondly, the annexation of Mexico was controversial because it would mean extending U.S. citizenship to millions of Mexicans. [W]e have never dreamt of incorporating into our Union any but the Caucasian race—the free white race. To incorporate Mexico, would be the very first instance of the kind, of incorporating an Indian race; for more than half of the Mexicans are Indians, and the other is composed chiefly of mixed tribes. I protest against such a union as that! Ours, sir, is the Government of a white race.... We are anxious to force free government on all; and I see that it has been urged ... that it is the mission of this country to spread civil and religious liberty over all the world, and especially over this continent. It is a great mistake. This debate brought to the forefront one of the contradictions of Manifest Destiny: on the one hand, while racist ideas inherent in Manifest Destiny suggested that Mexicans, as non-whites, were a lesser race and thus not qualified to become Americans, the "mission" component of Manifest Destiny suggested that Mexicans would be improved (or "regenerated", as it was then described) by bringing them into American democracy. Racism was used to promote Manifest Destiny, but, as in the case of Calhoun and the resistance to the "All Mexico" movement, racism was also used to oppose Manifest Destiny. Conversely, proponents of annexation of "All Mexico" regarded it as an anti-slavery measure. I wont take credit, Gap took it down thanks to many native groups drawing attention to the issue. Its nice looking fassion.I like it and thanx for sharing it. Back on the topic of native fassion (SP! lol) , I am glad that GAP pulled that shirt, and actually a little surprised. But a few more of these higher profile cases, like this and the Navajo Nation vs. Urban Outfitters one, will give a little more insight to mainstream America - that Native people are alive and well, and not "disappeared", not "assimilated", not "conquered", not "exterminated", and need to be respected as fellow North Americans.